Admire gorgeous white tigers and playful dolphins right in the comfort of the world-class Mirage Hotel and Casino! Capture photos of magnificent white tigers and lions at Siegfried & Roy's Secret Garden, a jungle-like habitat complete with waterfalls. Observe bottlenose dolphins frolicking from the underwater viewing area of the Dolphin Habitat. Learn about these fascinating creatures from educational displays. The indoor habitats are a welcome respite from the desert heat and the perfect daytime diversion for the whole family! Escape the hustle-bustle of the Las Vegas Strip, and slip inside the famous Mirage Hotel and Casino to get close-up views of animals you would normally expect to see only in the jungle or ocean. Your admission ticket grants you access to both Siegfried & Roy's Secret Garden and the Dolphin Habitat, so you and your family can enjoy both exhibits at your own pace. 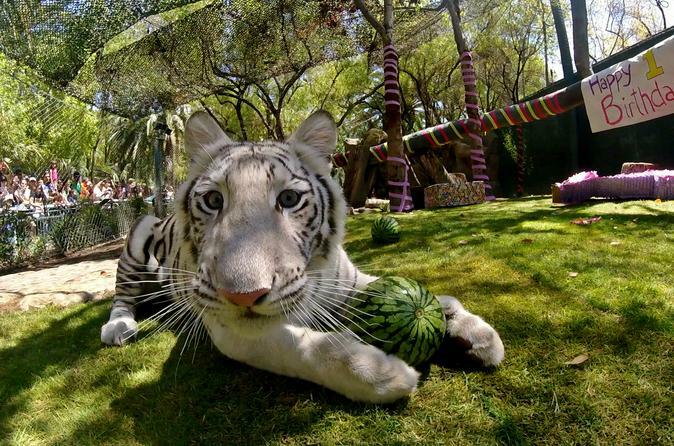 The dream of former Vegas headliners Siegfried & Roy, the Secret Garden showcases exotic endangered animals, including the famous white tigers and lions the duo long performed with. Unlike many similar habitats, this one features both snow white and striped white tigers, as well as white lions, leopards and panthers. Marvel at the regal animals as you wander through a lush oasis of jungle foliage and waterfalls, complete with music and a giant lion figure created out of plants. At the Dolphin Habitat, palm trees flank a 2.1-million-gallon water tank housing a family of charming bottlenose dolphins. See the playful animals swim and catch fish. You may even see one 'tail walk' — or leap out of the water and move backward on its tail. Try to catch photos of the swift, super-active animals racing through the tank. As you explore both the tiger and dolphin habitats, learn fun facts and figures about them from educational displays, and don't forget to browse the gift shops for cuddly souvenirs of your visit (own expense). Special Offer - Book with us and save 6% compared to another travel site! - Book Now!